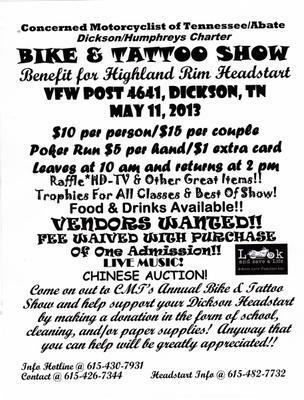 CMT/Abate of Tennessee, Dickson/Humphreys Charter Annual Bike & Tattoo Show with a benefit for Highland Rim Headstart. Its in Dickson, Tennessee, on May 11, 2013. A Poker Run leaves at 10am, and the event is located at the VFW Post 4641, in Dickson, Tennessee. Bike & Tattoo show with trophies, raffles, auction, live music,drinks and food available!! Also there will be a benefit for Headstart, please donate school, cleaning, and/or paper supplies when you come, help support these little ones!! We need VENDORS!!!! Fee is waived with the price of admission, which is $10 per person, $15 a couple and poker run is $5. Please come out and help support our Dickson Headstart!! !